Presidential candidates Hillary Clinton and Donald Trump responded to the mass shooting and apparent hate-driven terror attack at a gay nightclub in Orlando on June 12, 2016. Donald Trump and Hillary Clinton adjusted their presidential politicking Sunday, first offering prayers and support to the victims of the worst mass shooting in U.S. history. But they both infused their sympathy with statements that favor their presidential aspirations, and the presidential race rolled on. The presumptive candidates made statements hours after a gunman wielding an assault-type rifle and a handgun opened fire inside a crowded gay nightclub early Sunday, killing at least 49 people before dying in a gunfight with SWAT officers, police said. Another 53 were hospitalized, most in critical condition. Officials identified the shooter as Omar Mateen of Fort Pierce, Florida, a U.S. citizen born in New York. Clinton, the presumptive Democratic nominee, pushed for gun control and reached out to a key constituency — gays and lesbians. 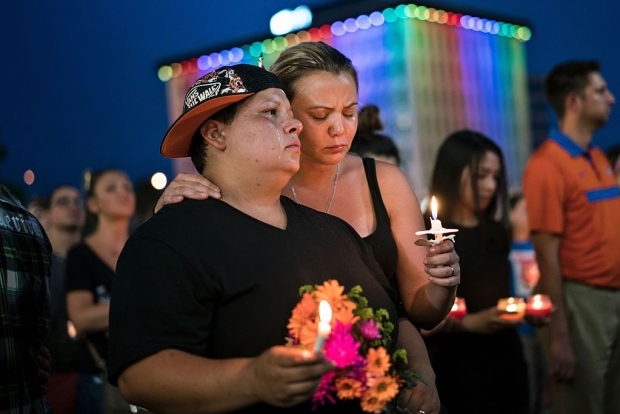 "The gunman attacked an LGBT nightclub during Pride Month. To the LGBT community: please know that you have millions of allies across our country. I am one of them," she said in a statement, adding a call to keep assault weapons out of the hands of "terrorists or other violent criminals." Trump, the presumptive Republican nominee, also offered words of support. But he then spent the day congratulating himself apparently for predicting more attacks inside the U.S. On Twitter, he renewed talk of his plan to ban Muslims from the U.S. for an indeterminate time. And he went after President Barack Obama. "Is President Obama going to finally mention the words radical Islamic terrorism? If he doesn't he should immediately resign in disgrace!" In his address Obama called the tragedy an act of terror and hate. He didn't talk about religious extremists, nor did others, reluctant to inflame a stunned nation already on edge about attacks inspired by the Islamic State group. Obama said the FBI would investigate the shootings in the gay nightclub as terrorism but that the alleged shooter's motivations were unclear. He said the U.S. "must spare no effort" to determine whether Mateen had any ties to extremist groups. Hours later, a law enforcement official confirmed to The Associated Press that Mateen had made a 911 call from the club, professing allegiance to the leader of Islamic State group, Abu Bakr al-Baghdadi. The official was familiar with the investigation but not authorized to discuss the matter publicly and spoke on condition of anonymity. The shootings inspired the candidates to shift their schedules and focus. Clinton's presidential campaign announced it was postponing its first joint event with Obama on Wednesday in Green Bay, Wisconsin, because of the Orlando shooting. Trump said he was changing the focus of his speech Monday at Saint Anselm College in New Hampshire from his case against Clinton to "this terrorist attack, immigration and national security." He also noted that he "said this was going to happen" and repeated his call for Obama to resign for refusing to use the words "radical Islam." Clinton, Trump added, should drop out of the presidential race for the same reason. Trump has proposed temporarily barring all foreign Muslims from entering the country and has advocated using waterboarding and other harsh interrogation methods. Trump's first tweet of the day was factual: "Really bad shooting in Orlando. Police investigating possible terrorism. Many people dead and wounded." Tweeted Clinton: "Woke up to hear the devastating news from FL. As we wait for more information, my thoughts are with those affected by this horrific act." The Clinton campaign later released a statement regarding Trump's comments saying: "Donald Trump put out political attacks, weak platitudes and self-congratulations. Trump has offered no real plans to keep our nation safe and no outreach to the Americans targeted, just insults and attacks. In times of crisis more than ever, Americans are looking for leadership and deserve better." And then they resumed their plans Sunday. On schedule, Clinton's campaign unveiled its first general election ad Sunday morning. It will run in battleground states beginning Thursday. And Sen. Bernie Sanders, still in the contest for the Democratic nomination despite Clinton's claim on it, went on with a round of appearances on the Sunday talk shows. He acknowledged the tragedy — then said he would not drop out of the race and endorse Clinton until he's convinced she's committed to fighting wealth disparity. He later issued a statement of sympathy to the Florida victims, with no political overtones. Two hours later, Trump responded to the Clinton ad. "Clinton made a false ad about me where I was imitating a reporter GROVELING after he changed his story. I would NEVER mock disabled. Shame!" The Clinton ad uses footage of Trump onstage, flailing his arms in an apparent attempt to mimic New York Times reporter Serge Kovaleski, who suffers from a congenital condition that restricts joint movement. At the time, Trump was taking issue with a story Kovaleski had written for The Washington Post. Roughly two hours after that tweet, Trump returned to the shootings. "Horrific incident in FL. Praying for all the victims & their families. When will this stop? When will we get tough, smart & vigilant?" he tweeted. An hour later, he followed up with some self-praise: "Appreciate the congrats for being right on radical Islamic terrorism, I don't want congrats, I want toughness & vigilance. We must be smart!" Trump later postponed a Monday rally in Portsmouth, New Hmapshire, but will make a speech at St. Anselm's College in the afternoon, his campaign said.